‘Pithle’ or ‘Pithla’ is an authentic Maharashtrian recipe, a comfort food prepared in every household in Maharashtra. Pithla-bhakri is a must have. Bhakri is a kind of bread prepared from various flours like rice, ragi, jowar, bajra, etc. I still remember the delicious pithla my mom used to make, I relish it. Since now I am away from my mom, I don’t know when will I get to eat it again. But this is her recipe, she taught me, and I made this for the first time today. 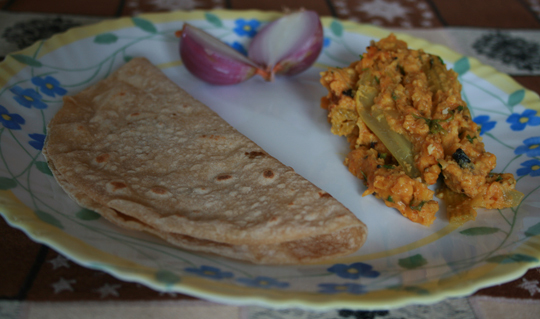 This Pithla is prepared with gram/chickpea flour, though there are different recipes of pithla prepared with few other types of ground lentils (kulith). Apart from bhakri, it could be eaten with chapati (Indian bread) or rice. Pithla-bhakri is commonly known as a ‘poor man’s meal’, but an ideal marathi meal to be had after a tiring day of work. 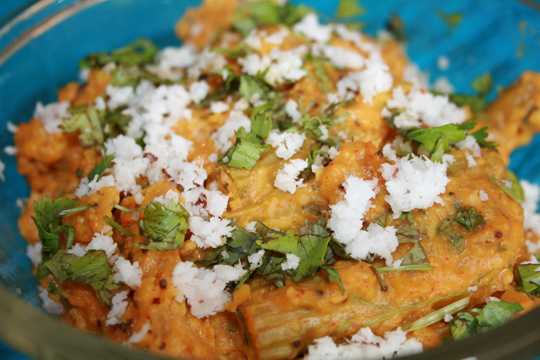 2 tbsp chopped coriander leaves and 1/4 cup of freshly grated coconut to garnish. In a kadhai/pot, heat some oil. Add mustard and let them splutter. Then add asafoetida, onion and saute until onion becomes soft. To this add tumeric and red chilli powder and fry for a minute. Then add the drumsticks and 2 cups of water, cover and cook on low-medium flame until they are tender. (Do not over cook else drumsticks will become very soft and break everytime you mix) Then gradually add gramflour, little at a time, and keep mixing continuously to avoid lumps from forming. Mix well, add kokum and jaggery mixture and stir lightly. Cover and cook for a minute. Then add some coriander leaves and grated coconut, stir and serve.